This cigar is the latest addition to the 1964 series. It’s well made like all Padrons. 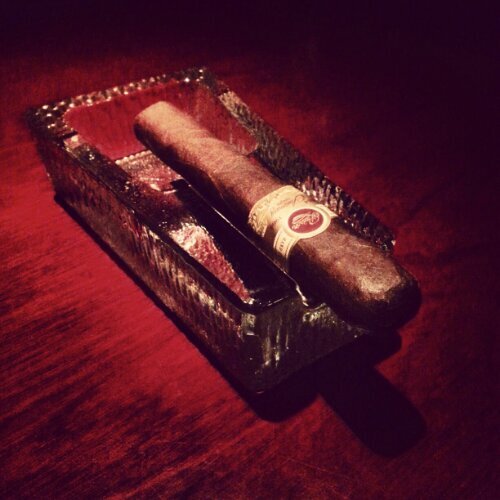 Im not a big fan of the fat cigaes but since its a Padron i had to try it. Lets see how it smokes. This beast produced a blast of pepper with the first couple of puffs, the thing that made me afraid, but that didn’t last for a Long to the smoke to settle down. Half an inch I started to find out what’s going on here, the smoke is lower medium and the flavors is sweet cocoa, leather and wood. At the very end of this third the cigar started to build up some strength, and the flavors started to speak loader. The smoke here at the 2nd third is straight medium, and the flavors too. With some woody notes and new flavors add like maple and caramel and it started to get hints of “Padron”. Some mild coffee notes added at the last part of this cigar, but the strength is still medium at most. Ok this cigar was a fail in the Padron line in my book. Lacked of the strength and flavors. The pepper at the beginning dispersed quickly and didn’t show up again. It didn’t change my mind about the “Jaw Breakers” the fat cigars. I won’t smoke it again and I won’t recommend it to anyone.